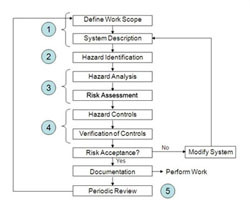 iterate back to step (1) to ensure no additional hazards have been introduced by controls or changes to the system and its components. See Operating Procedures (for Change Control). 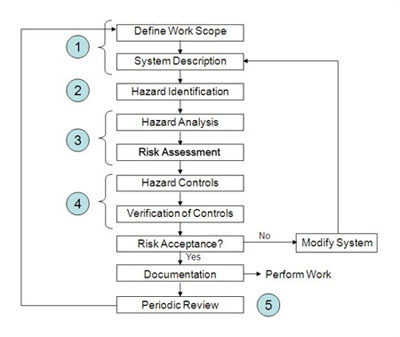 The Hazard Analysis and Risk Assessment process should include members of the project and/or safety teams that have expertise in the various aspects of the project (e.g., project management, chemical systems, electrical systems, waste management, etc.). The process should continue throughout the operational lifetime of a system. New hazards may be identified for an aging system or as operational envelopes change over time. These new hazards, and their associated risks, must be continually identified, evaluated and resolved.